Open box item, broken tab, all parts can be used properly. 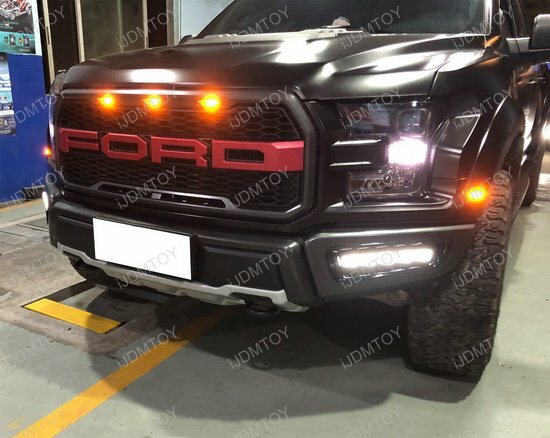 Give your Ford Raptor a one-of-a-kind look that enhances its natural industrial body style with powerful & aggressive switchback lighting fit for daily use and off-roading! 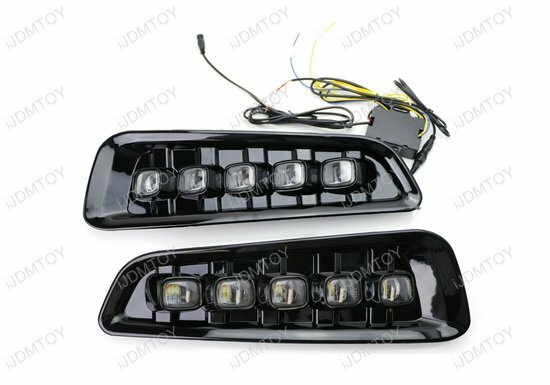 Q: What car will this LED daytime running light/turn signal assembly fit in? A: The 5-light white/amber switchback LED daytime running turn signal lights are made to fit the 2017-up Ford F-150 Raptor. 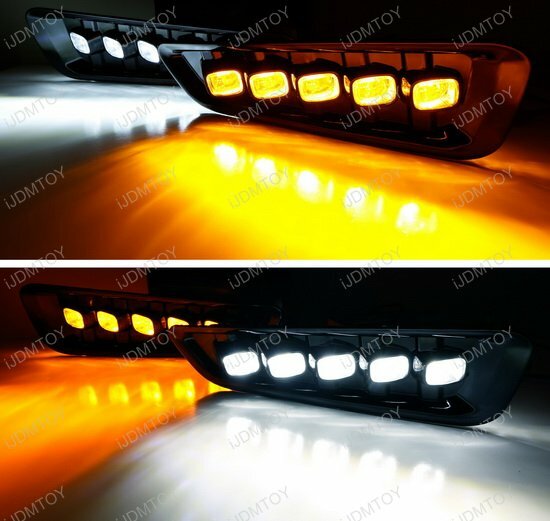 This switchback LED assembly will not fit in the standard Ford F-150 or any aftermarket Raptor-style bumpers. 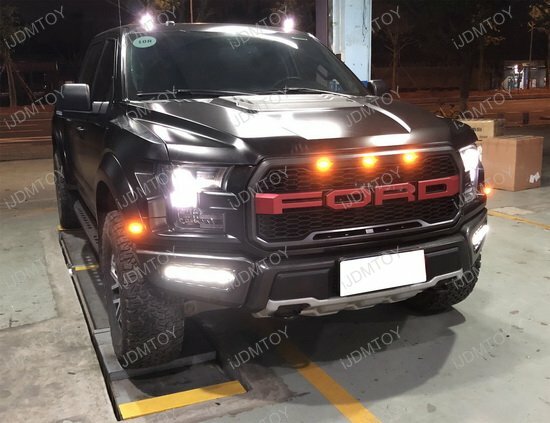 Q: How does the Ford Raptor switchback LED DRL turn signal lamp set work? 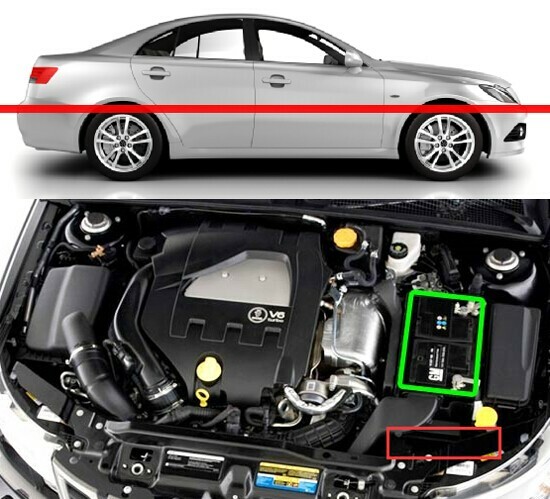 A: The xenon white LED light will run by default as daytime running lights or parking lights. When you turn on your turn signals, the LED lamp will exclusively flash in amber yellow, switching back to the running xenon white light when you complete your turn or merge. 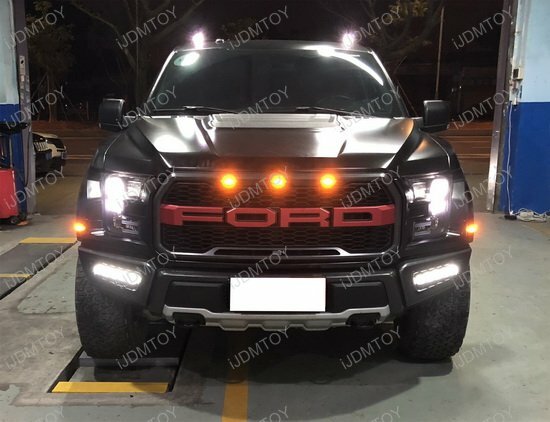 Q: How do I install the Ford Raptor foglamp location switchback LED DRL turn signal lamps? A: Watch the video below to learn how to install the LED daytime running lights with turn signal functionality. Maximize the potential of your Ford Raptor. 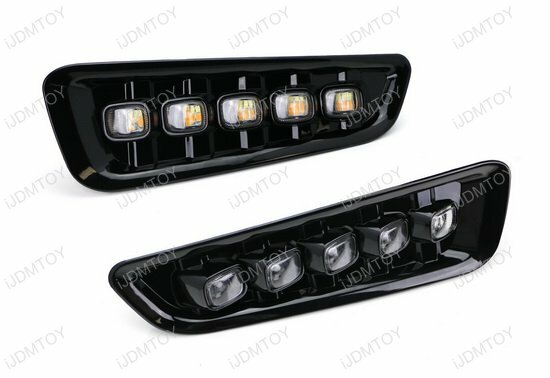 Utilize its flexible lower bumper openings to make your Ford pick-up the complete package by adding a set of LED daytime running/turn signal lamps! 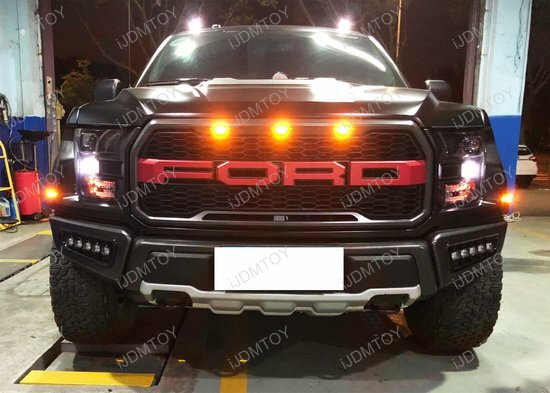 This page features the 5-lamp white/amber switchback LED daytime running lights with turn signals exclusively fit for the 2017-up Ford F-150 Raptor. 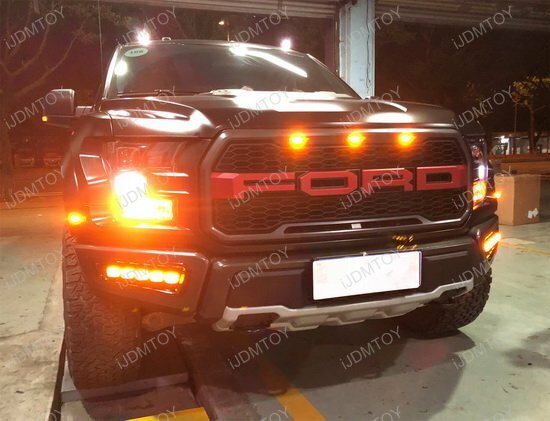 Please note this LED DRL turn signal set will NOT fit in the standard Ford F-150 or aftermarket Raptor-style bumpers. 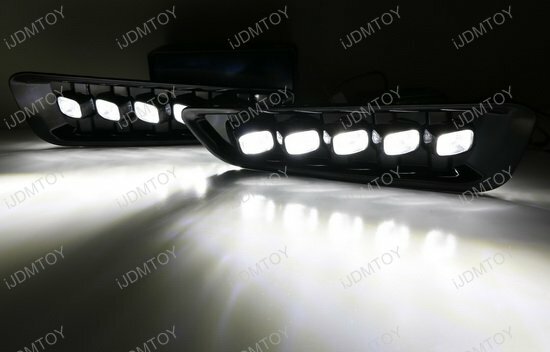 Each powerful and stylish LED daytime running lamp presents five LED lamps arranged in a spotlight display. 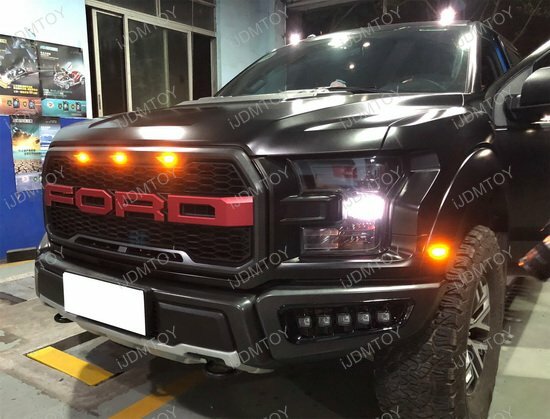 The Ford Raptor LED DRL turn signal assembly is powered by a combined 30 pieces of xenon white LED chips running as daytime running lights and 30 pieces of amber yellow LED chips running as turn signal lights. Between the two LED lamps, that is a total of 60 LED emitters to give you the most vibrant and powerful shine! The white/amber LED daytime running turn signal assembly flashes in switchback fashion, lighting up in white as DRLs by default. When engaging your turn signals, the Ford Raptor LED lamp assembly exclusively flashes in amber yellow until you complete your turn or merge, switching back to a running xenon white light. Housed in a piano black glossy finish, the switchback LED daytime running lights with turn signal functionality fits seamlessly in your Ford Raptor's fog light opening, giving your robust Ford pick-up truck a full-bodied appearance. 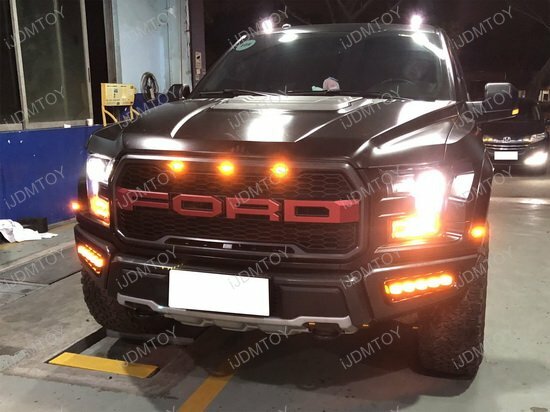 So if you are looking to give your F-150 Raptor a true one-of-a-kind look and aggressive LED lighting for daily driving and off-roading, look no further than the switchback LED daytime running turn signal lights!